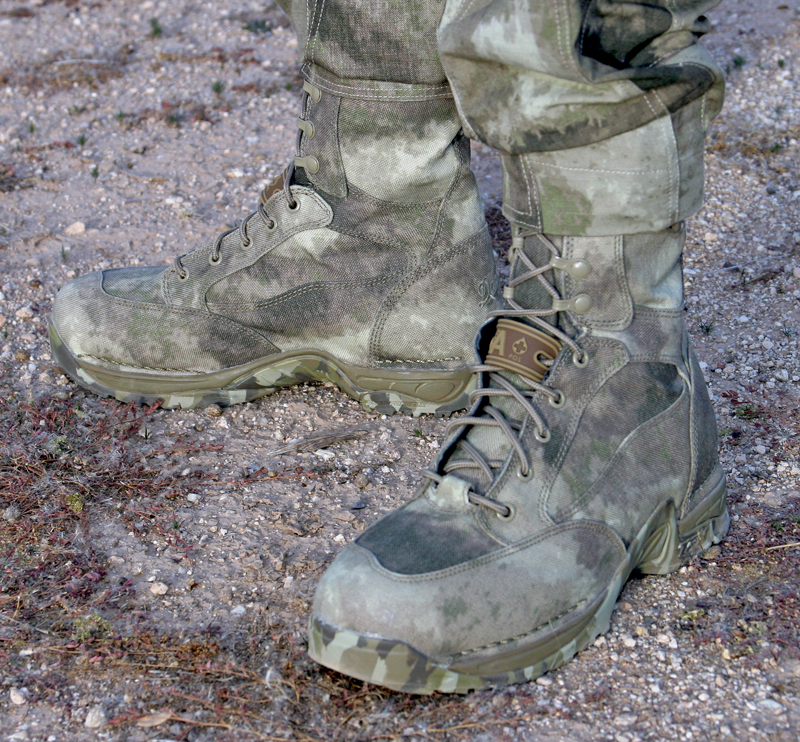 Danner’s new A-TACS pattern TFX Hot Uniform Boot. A Gore-Tex lined version, the Desert TFX GTX is also available. Danner is the first footwear brand to release an A-TACS camouflage tactical boot. 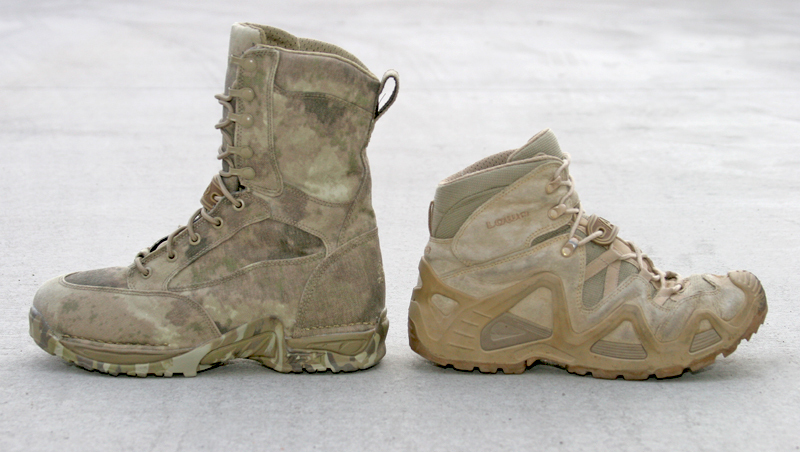 Their Desert TFX is sold in two versions, the Desert TFX Hot Uniform Boot and the Gore-Tex lined Desert TFX GTX Uniform Boot. 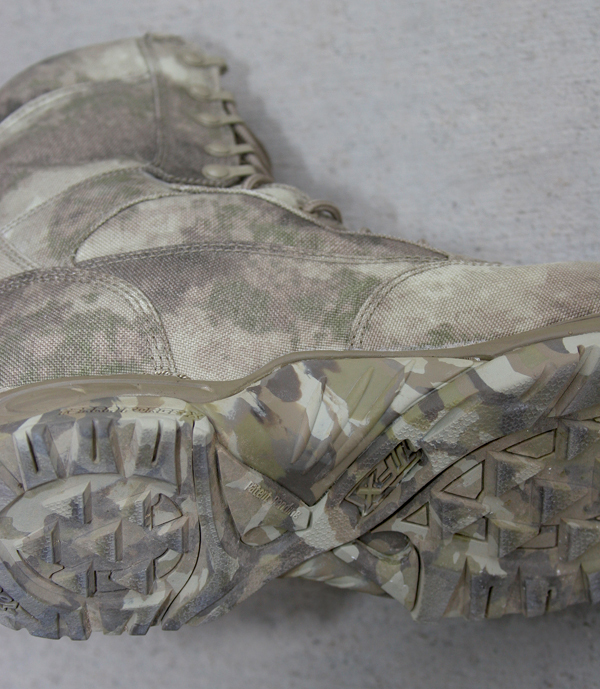 Both boots feature a molded A-TACS outsole and patterned upper in the A-TACS camouflage scheme. This review is for the Desert TFX Hot Uniform Boot, Danner Style no. 26033. The two boots are differentiated by $20 in price at retail and by the Gore-Tex lining of the Desert TFX GTX version. The Desert TFX Hot boot (no Gore-Tex) is $170 USD MSRP and the Desert TFX GTX (with Gore-Tex) is $190 USD MSRP. Each boot shares the same design and it is difficult to tell the difference between the models by looking at them from the outside of the boot. The A-TACS camouflage scheme on the Desert TFX Hot boots is highly effective. The choice of whether to use the Gore-Tex or non-Gore Tex “Hot” version is determined by your exposure to wet conditions. If you operate in an environment where you are walking on wet ground or in shallow water the Gore-Tex Desert TFX GTX version will be worth the extra $20 to you. That said, it is not a “better, best” progression from the $170 TFX Hot boot up to the $190 TFX GTX boot. They are simply intended for different environments. Desert and arid users will be more comfortable in the Desert TFX Hot version. Even though the W.L. Gore & Associates Gore-Tex sock liner built into the TFX GTX version is thin and breathable it still makes any boot warmer than an identical non-Gore-Tex version. The Danner Desert TFX Hot (left) is a tall boot compared to my trusty Lowa Zephyrs (right). This is a tall boot. It measures 10.75″ (27.5 cm) from bottom of sole to top of tongue. If you wear pants that have lower pockets and still want to blouse them at the top of the boots it may get crowded. If you want the ankle support and stability of a higher boot this is a great choice. The boots use 10 eyelets per side with the bottom five being round grommets and the top five a closed speed lacing system. The boots are Airborne compliant since there are no open speed lace hooks. The top speed laces are not very speedy though with the laces provided. It takes a moment to put on and take off these boots since all of the top five eyelets need to be loosened up to get your foot in or out. For users who put on their boots at the beginning of a long operation and don’t take them off for 20+ hours it isn’t an issue. If you need to frequently remove and replace boots in a hurry this boot will be a challenge. In general the benefits of an Airborne compliant lacing system and great ankle support are worth it. I’m not in favor of a zipper side version since few of those work or last well. 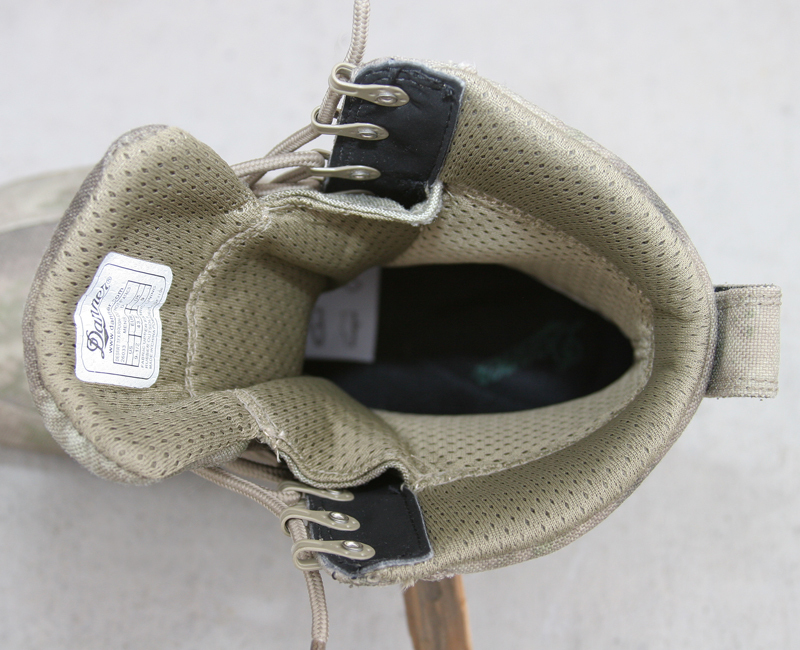 The upper of the boot uses a heel loop for donning. The top “speed lace” closed eyelets are Airborne compliant. The top of the boot has a padded collar and a study 1.25 inch (3 cm) pull tab for donning. The tongue is built into the entire upper section with no opening at the side of the tongue. This design prevents entry of dust, sand and debris. It also prevents accidentally pushing the tongue down into the boot while donning. The liner of the TFX Hot Boots is a perforated moisture wicking mesh. The thoughtful design of the interior of this boot is one of the best I’ve worn. Another look at the camouflage sole. The boots are light and responsive on all terrain. They provide excellent protection and support considering their light weight. The upper is 1000 denier Nylon with all seams double stitched at 10 stitches per inch. The upper fabric reminded us of Cordura but is not listed as such in Danner’s sales literature. There is a distinct molded toe box and heel counter under the fabric to help the boot retain its shape and improve durability while providing a measure of foot protection. The upper is built on Danner’s “TERRA FORCE X” platform. TERRA FORCE X is a patent pending motion control system that resists torsional load at the arch/midstep making the boots more stable while protecting the arch. An internal shank section is combined with an insole plate to improve the “ride”. TERRA FORCE X is also used in the Danner 453 GTX and Instigator hiking boot among other Danner footwear. The molded sole is light, provides good traction and is flexible in the forefoot but stiff enough to be protective in the midsole. The external features of the TERRA FORCE X sole are visible here. The A-TACS coloration of the outsole is slightly lighter in shade compared to the upper A-TACS camouflage colors. This is done on purpose since the sole will turn darker as wear and dirt accumulates. The concept of camouflaged boots including the sole is absolutely a valid one in the modern tactical environment. 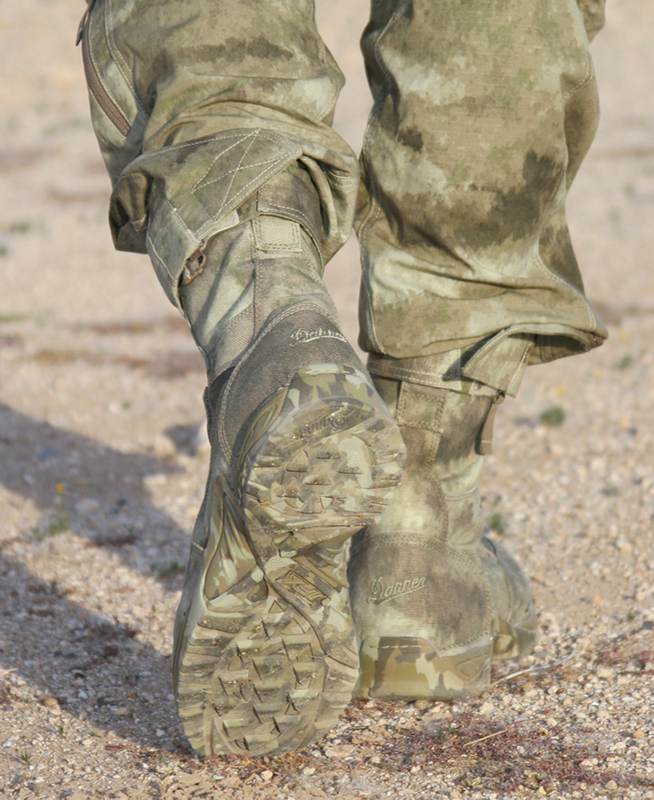 Older solid color boots were designed mostly with garrison wear in mind and don’t suit the modern tactical environment. Even the recent generation of green and coyote/tan color boots don’t blend well with camouflaged uniforms. 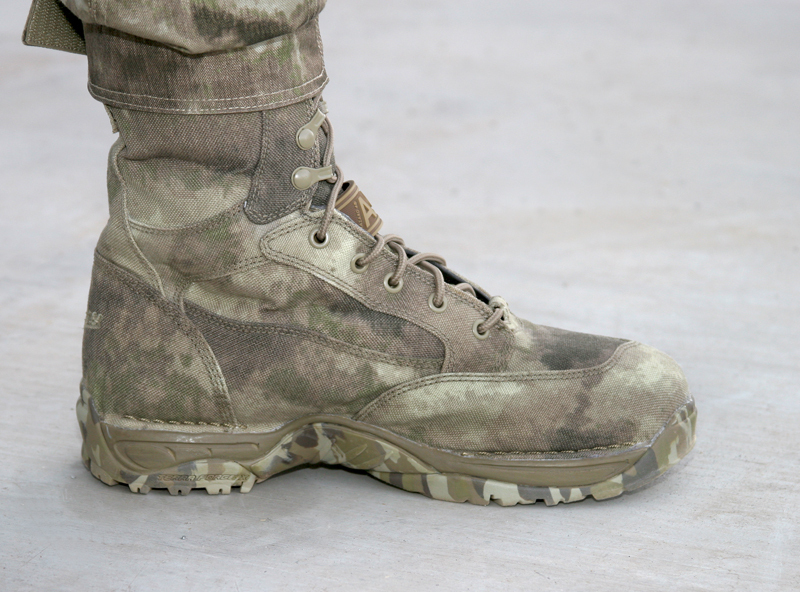 Given the effectiveness of the new camouflage patterns like Multicam and A-TACS it’s only logical that footwear manufacturers build their boots to work with camouflaged uniforms for overall visual stealth. Even in the prone position the sole of the boot remains difficult to see since it is also camouflage patterned. The integrated tongue prevents grit, sand and rocks from entering the boot. The mesh lining dries quickly and provides good breathability. My first impression when donning the Danner Desert TFX Hot Uniform Boots was a new pair of issue jungle boots combined with a trail running shoe. Since these are lined they are more comfortable than old jungle boots and provide a supportive light, maneuverable feel. The outsole design is very good, a substantial improvement over more traditional style, stitched and glued-on Vibram style outsoles and old Corcoran style sole construction (even Corcoran has gone to a molded outsole boot in their 8″ JAC Boot). The boot soles feel similar to the Adidas GSG-9 and Oakley tactical boots but in a more robust, field combat boot construction. Footing and flexibility is very good even on loose scree and uneven terrain. The light, molded outsole makes these boots feel nimble and easy to move in while providing good traction. Two testers wore the boots on rocky desert terrain that was flat to extremely mountainous. Wear and tear on the boots is better than I expected for a fabric upper, molded lower boot. They also clean up well with a wet cloth and soft brush. This non-Gore-Tex boot dried very quickly in desert terrain after stream crossings and remained comfortable even when wet. Although we did not swim in the boots we did fit them with swim fins to see how they worked. The Omega Aquatics Stealth Max folding tactical swim fin in the larger sizes worked with our size 9.5 US test boots. While I normally wear a lower boot I see a lot of advantages to a boot this light and nimble with a higher upper. For a fast-rope or Airborne insertion, especially onto rugged terrain followed by a long ruck I would absolutely rather have these than lower boots. The Danner TFX Hot A-TACS boots are also much lighter than they look at 25.9 ounces (736 grams) per boot measured weight in a size 9.5 US. 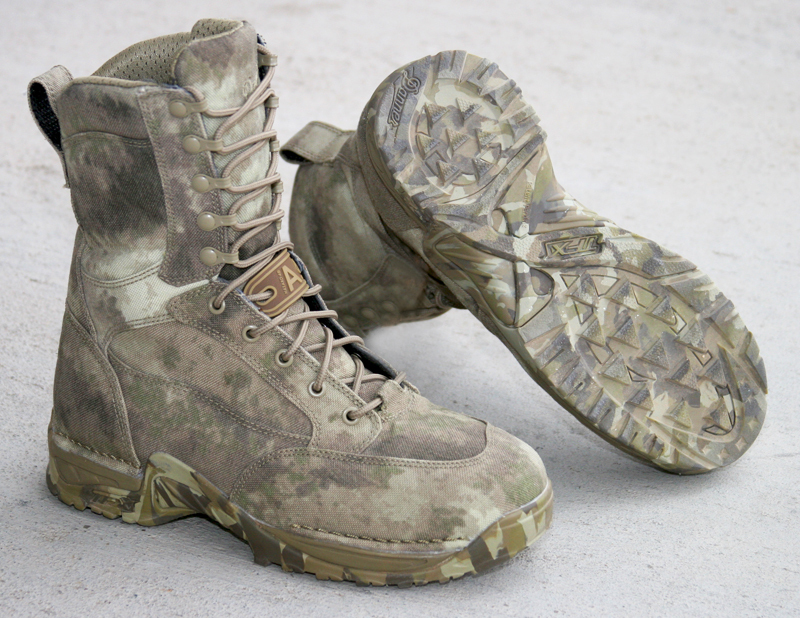 In general this is perhaps the strongest offering in a fully integrated camouflage boot from any manufacturer so far. Following the delays of the Magnum Multicam boots, which may become available this week after a 6 month delay, it becomes obvious that this isn’t an easy concept to execute on a production level. Danner is an experienced, high end footwear company with a long history of professional grade footwear. The Danner TFX Hot A-TACS boot continues that legacy of solid construction and performance along with impressive innovation.